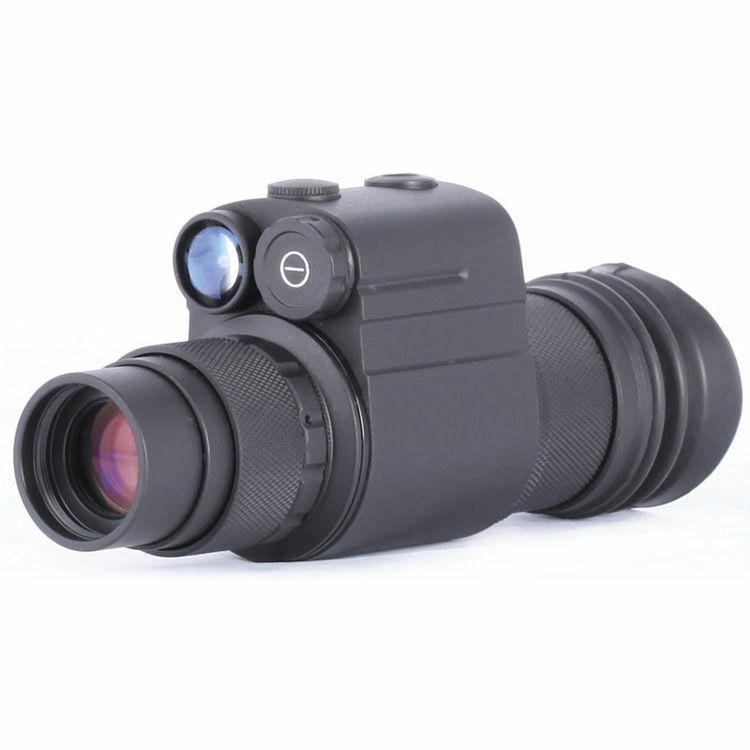 The Ambia 1x 3rd Generation Night Vision Monocular from Night Optics features a 3rd generation filmless autogated intensifier tube with resolution of 64-72 lp/mm and automatic brightness. It will enable you to see brighter and clearer images than 1st and 2nd generation devices with similar optics. While the filmless microchannel plate improves signal-to-noise ratio and efficiency of intensifier, the autogating allows operation in high-light, protects from bright light burnout, and extends life. Outfitted with the automatic brightness control, the device will regulate image brightness to maintain the same visibility.To maximize image brightness in the lowest of lighting conditions and in complete darkness, the monocular also carries a built-in IR illuminator that can cast extra infrared light on your targets. The optical system features a multi-coated 26mm f/1.2 lens system, 1 x magnification, a 40° angular field of view, and a minimum focus of 10". The body is made of a lightweight, durable, and impact-resistant polymer that offers and water-resistant performance. The rubber wing eyecup prevents spill-over of light from the tube and offers a comfortable cushion between your eye's orbit and the eyepiece. Note: Export of this device described herein is strictly prohibited without a valid export license issued by the U.S. Department of State office of Defense Trade Controls, as prescribed in the International Traffic in Arms Regulation (ITAR), Title 22, Code of Federal Regulation, Parts 120-130, and/or the U.S. Department of Commerce. For further information contact the Office of Defense Trade Control and/or the U.S. Department of Commerce.